New algorithm lets users toy with Eighties synth scores and 8-bit video game soundtracks. 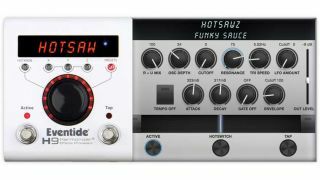 In this new clip from Eventide, the company introduces PitchFuzz, a new multi-effect algorithm for their H9 Harmonizer stompbox. Eventide has released a new video introducing Sculpt, a distortion algorithm for the company’s H9 Harmonizer pedal.